Your stay is complimented by our full English breakfast each morning. 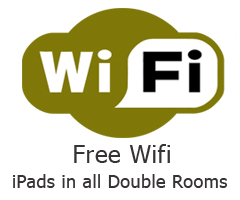 All of our rooms have a well stocked hospitality tray, hairdryer, TV with freeview (rooms 3,6 & 8 have internet-connected TV’s with movies on-demand), DAB radio/alarm, iPad in all double rooms, complimentary toiletries, use of toweling bathrobes & slippers and mini fridge with complimentary mineral water. We have two king-size size luxury en suite rooms (rooms 3 & 6), one super-king luxury room (room 8) and three luxury double en-suite rooms (rooms 4, 5 & 7) and our single fab en-suite room (room 2). All rooms have new en-suite facilities. What a Luxurious room! at the front of the house, so has a great side view to the sea and has a gorgeous king-size black bedstead with a full en-suite complete with a bath. Originally the first floor sitting room, this bedroom is on the first floor and is the largest room in the house and enjoys high ceilings with original cornicing and full height bay windows with views back down to the sea! Our room 4 is on the first floor and although it is our smallest double it enjoys high ceilings and a large window overlooking our courtyard. Our room 5 is a luxury double room to the rear of the property on the 2nd floor. This is a bright and spacious room at the front of the house on the 2nd floor that enjoys oblique sea views. This is a double room to the rear of the property on the 3rd floor. This is a bright and spacious room on the 3rd floor at the front of the house and the room enjoys oblique sea views.